The Bentley Historical Library's Mellon-funded ArchivesSpace-Archivematica-DSpace Workflow Integration project (2014-2016) united three Open Source platforms for more efficient creation and reuse of metadata and to streamline the ingest of digital archives. We continue to explore innovative archival practice and emerging technologies to curate our collections—read all about it here! I'd be interested to know whether for other collections of born digital data (not research data) a higher success rate would be expected? Is identification of 37% of files a particularly bad result or is it similar to what others have experienced? Extracting technical metadata with the file profiling tool DROID has been part of our digital processing procedures for born-digital accessions since the beginning, so to speak, about 2012. Right before deposit into DeepBlue and our dark archive, a CSV export of DROID's output gets included in a metadata folder in our Archival Information Packages (AIPs). Kudos to Nancy Deromedi and Mike Shallcross for their foresight and for their insistence on standardizing our AIPs. It made my job today easy! ...and wrote a short script to make one big (~215 MB) DROID output file. Note that I had the script skip over Folders (because we're only interested in files here), packaged files, like ZIPs (because DROID looks in [most of] these anyway) and any normalized versions of files, which I could identify because they get a "_bhl-[CRC-8]" suffix. Kudos again to Nancy and Mike for making this easy. 657,808 (99.9%) of those files that were identified were given just one possible identification. 610 files were given two different identifications, 1 file was given three different identifications, 3 files were given five different identifications, 13 files were give six different identifications, 45 files were give seven different identifications, 28 files were given eight different identifications, and a further 12 were given nine different identifications. In all these cases, the identification for 331 files was done by signature and the identification for 380 files was done by extension. 38,669 (5.9 %) of the identified files had a file extension mismatch (which means that the file extension was not what you would expect given the identification by signature), even though we actually have a step in our processing procedures that tries to address missing or incorrect file extensions. Like Jenny, we do have a long tail of file formats, but perhaps not quite as long as the long-tail of research data. I actually expected it to be longer (10.1% seems pretty good... I think? ), since at times it feels like as a repository for born-digital archives we get everything and the kitchen sink from our donors (we don't, for example, require them to deposit certain types of formats), and because we are often working with older (again, relative) material. In thinking about how the community could continue to explore the problem, perhaps a good start would be defining what information is useful to report out on (I simply copied the format in Jenny's blog), and hear from other institutions. It seems like it should be easy enough to anonymize and share this information. What other questions should we be asking? I think Jenny's questions seem focused on their goal of feeding information back to PRONOM. That's a great goal, but I also think there are ways we can use this information to identify risks and issues in our collections and assure that our or our patron's technical environments support them, as well as to advocate in our own institutions for more resources. And, if you haven't yet, be sure to check out the original post and subscribe to that Digital Archiving at the University of York blog! Also be sure to check out the University of York's and University of Hull's exciting, Jisc-funded work to enhance Archivematica to better handle research data management. Thanks so much for providing these comparable stats. Will definitely be referencing them in our phase 3 report for the Filling the Digital Preservation Gap project. Interesting so see these stats for a data sample size that is larger than mine too. Your findings really do seem to back up the fact that research data is harder to identify currently - you have a pretty high identification rate and that is great. Also a much higher accuracy with those identifications (being mostly by signature or container rather than extension). 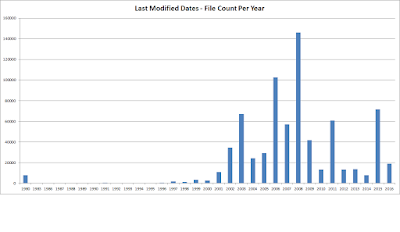 Wonder if the date range also has an impact - the average age of my research data being more recent and perhaps containing 'newer' types of file format. I'm guessing it is the case that a format that has been around a long time is more likely to have found its way into PRONOM than a new one. Curious about your little batch of files from 1980? That's old! Many thanks again for this interesting comparison! Great observations about identification rate and accuracy as well as date range! Yes, those 1980 files... I thought they were a bit of an anomaly myself. We had some other files from 2025 (which I excluded from this blog so that others wouldn't know we had discovered the secret to time travel here at UM), so I'm sure there's some sort of error. Needs further investigation!